Smart bins send emails when they are full! Self compacting bins that send an email when they need to be emptied – no we are not kidding! There has been a quiet revolution going on in the leafy streets of Dun-Laoghaire Rathdown and Dublin City Council will follow shortly. Traditional public litter bins have been known to fill and overflow quickly, especially on sunny days in seaside towns and areas such as Dún Laoghaire-Rathdown. Given the vagaries of the Irish weather system, it can be an impossible task to know when the bins outside a certain ice cream shop, or boardwalk need to be emptied. Dún Laoghaire-Rathdown Council was looking to improve the efficiency of its public waste collection service, and at the same time reduce operational costs. Through the introduction of Smart Bins, it has successfully achieved this and more. Smart Bins are solar powered, wifi enabled bins that are being installed in towns, villages and residential areas across the country to replace traditional public litter bins. Smart Bins come with a built-in solar compactor which gets triggered when rubbish reaches a certain level. Rubbish is compacted, which enables it to reach a whopping 800 litres of waste: 6-8 times that of a traditional bin! The wifi-enabled bin is able to communicate when the waste reaches 85% capacity. The bin actually sends a text and email to the relevant waste management division informing them that it is ready for emptying. Optional extra sensors can provide other info such as air quality, sound monitoring, travel times between location, and even wifi up to 25m radius! “The challenge is to use this smart information to deliver a more efficient service and a better environment to residents i.e. cleaner streets and less annoyance due to traffic and noise of collection” Richard Shakespeare, Director of Municipal Services, DLR. 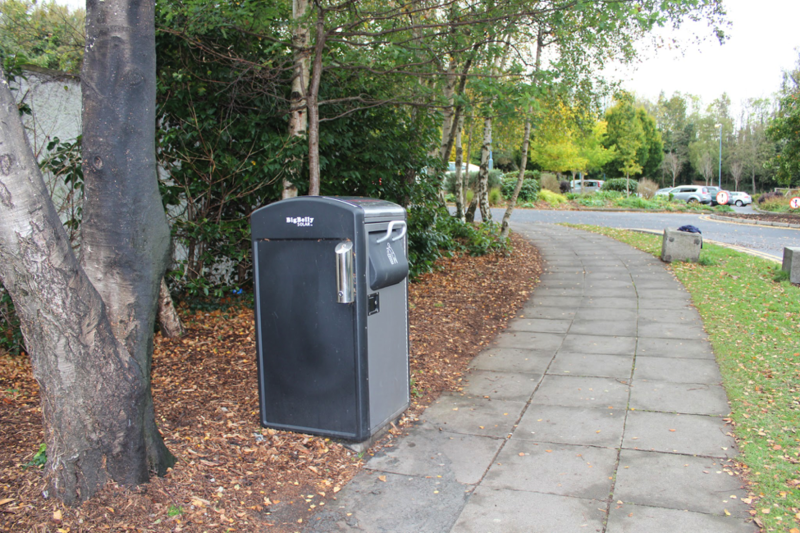 There are currently 401 Smart Bins installed in the Dún Laoghaire-Rathdown County area. The project is managed by the County Council by the Environment Department with the purpose to improve the efficiency of waste management. Since 2010 the bin collection service has been transferred to Panda Waste. Dublin City Council completed 2 smart bin pilots after consultation with the market. The results were very positive and a tender was issued at the end of 2016. Smart bins are expected on the city streets shortly.